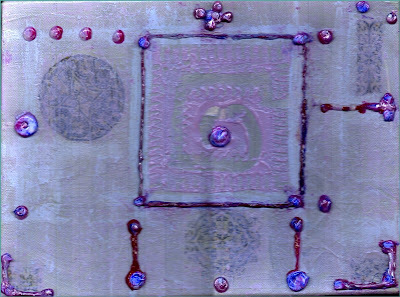 Acrylic paint and mediums-gloss gel, paste, and glaze on canvas 9"x12"x.75"
Violet and iridescent pearl layers are transparent enough for the Celtic transfers to still be seen. Lots of texture and the "opalescent" effect is the final stage. Ohh Julianne, this is fantastic and the colors I adore, too! I really love this new direction you are taking with your paintings. You have clearly hit the title correctly. The richness of jewels is loud and clear in this piece! I have been so busy lately, so that is the reason I have not been around more. I am glad I am back now, though. I am so glad you are back too!! I have so much I want to tell you. I will write you soon. Miss you soooo much! !